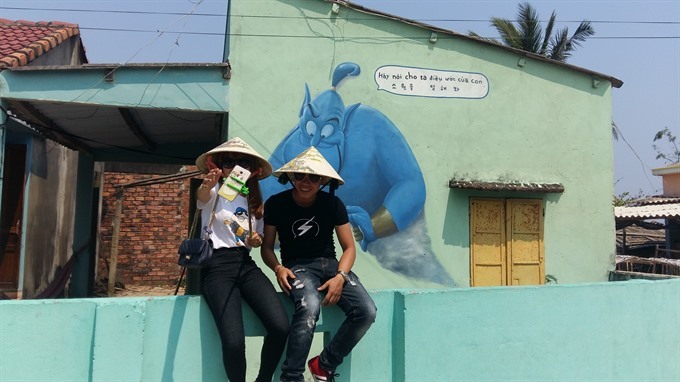 Korean artists help a commune in Quảng Nam Province become a unique, community-based art space, adding literal colour to daily lives and helping residents earn tourism income, Bùi Hòai Nam reports. For around 500 years, Tam Thanh Commune in Quảng Nam Province has been sheltering generations of fishermen and their families. But this is not surprising in and of itself. Fishing communities have thrived in coastal areas for a long time. It is also not surprising that the commune has a beautiful beach, and that it also has a river flowing through. But what has really changed the face of this commune, in a literal, symbolic and totally unexpected transformation that has added great value to daily life for its residents, is art. Tam Thanh is home to about 6,000 people in seven villages standing along a 6km stretch of unspoilt beach. The life of local residents, mostly fishermen, has changed in many ways after the commune hosted an art space late last year. 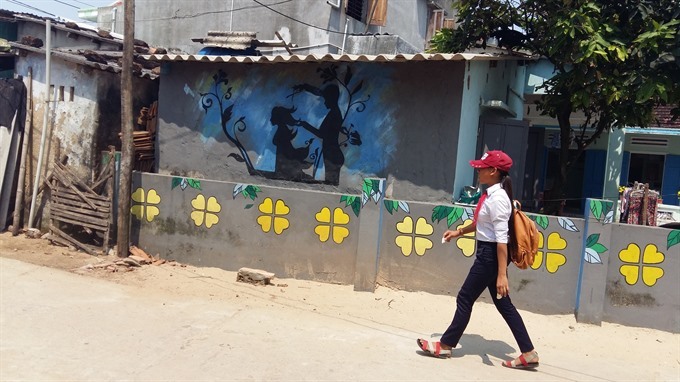 The moss-covered walls of dozens of houses in Trung Thanh Village had colourful murals painted on them by the Korea Foundation Community Art Exchange Programme. The art works feature daily life in the area, including fishing and related activities. Some of the old houses and fences in the area now sport 3-D paintings. The paintings of muscular fisherman and beautiful, smiling vendors, pets and marine creatures have not just charmed visitors, they have given locals themselves a different perspective. “It’s amazing. It is exciting to see our lifestyle through paintings. 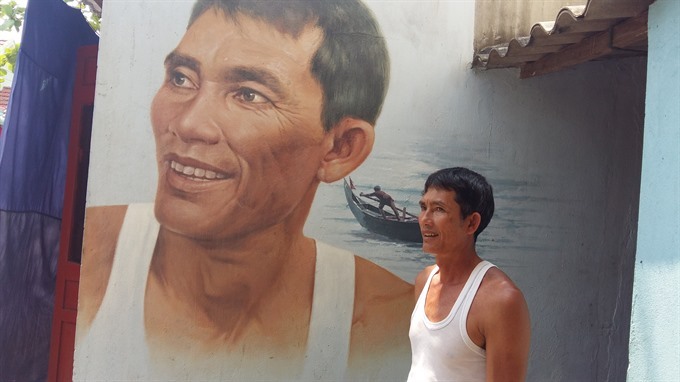 I could not image that our hard job is portrayed so beautifully on our walls and fences,” said Võ Ngọc Liêm, a fisherman in Trung Thanh Village. Liêm, 51, was portrayed himself by South Korean artists when he was away for two nights on an offshore fishing trip. He said the painting not only attracts visitors, but also protects his house. The fisherman said his neighbours were earning more money now from selling beverages and collecting bike parking fees from tourists making weekend visits to the village. The walls and fences of other houses carry different images, including ocean life, fish markets, street vendors, dogs, kids, kite flying, basketball and sunset on the sea. Trần Thị Quý, 87, is over the moon about having her dog painted on the wall of her house. “It has lived with my family from when it was born. I love it so much. It goes around the village every day and only sleeps in the foyer. Now its image is on the wall near its shelter, and many visitors take pictures,” Quý said. “My house has become busy with visitors coming every weekend. They take photos and talk to me. They ask about the dog, my family and of course buy something from my shop – water, dried fish, snacks, fruits or even local, homemade fish sauce,” she said. The old woman has been depending on her children and the meagre pension she gets from the government, but her sense of well-being has increased significantly. Quý said sometimes visitors are able to snap the dog along with its portrait on the wall. A few hundred metres away, Lê Thị Liên, 64, offers bike parking services and runs a coffee shop at the village’s entrance. “My house is next to an alley that has walls painted with murals now. It’s a very beautiful alley. 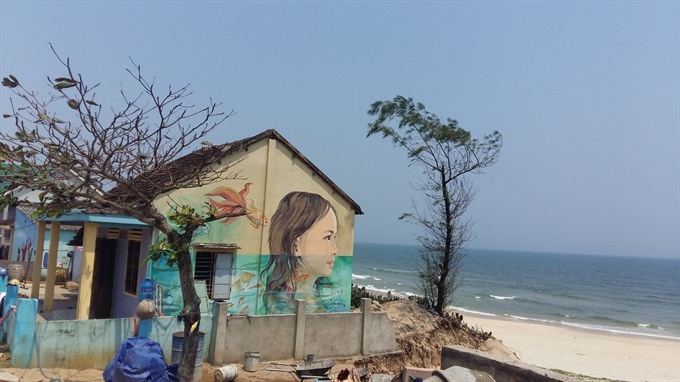 The beach can be seen at the end of the road, and fences of houses are decorated with paintings of ocean sceneries,” Liên said. She said she had been a housewife doing odd jobs earning very little money. “My husband and other men in the village all go fishing in the sea, only women and children stay at home to do house work. However, the mural project has attracted more people and we have benefited from offering local services,” she said. Liên said she is now able to earn about VNĐ100,000 each day from selling fish-sauce and snacks as also selling and renting out conical hats. Đỗ Đình Đồng, the village chief, said he could not imagine how much the village has changed since it began hosting an art space in community. “The villagers and I thought they (artists) were just volunteer painters working for a charity under the Korea Foundation Community Art Exchange Programme, but it entirely changed our lives for the better. Đồng said the income of villagers had doubled just six months after the mural project was introduced last August. He said villagers were earning an average income of VNĐ42 million (US$1,900) a year instead of VNĐ24 million (nearly $1,000). More than 110,000 litres of fish sauce and 550 tonnes of fresh seafood were sold just a few months after word spread through young off-road travellers and back-packers. 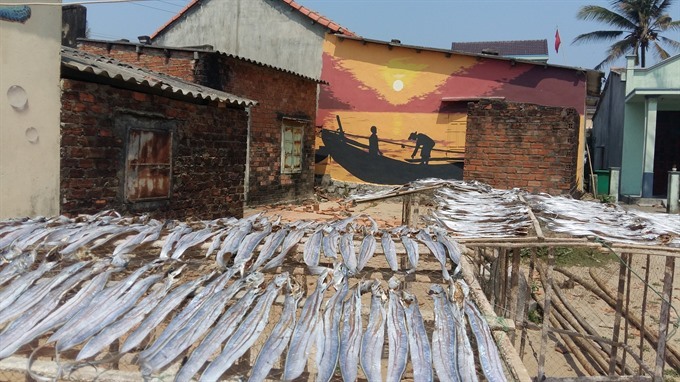 Đồng recalled that villagers used to struggle to sell their fish sauce and seafood away from home, and earned little profit. Local fishermen say visitors can smell the natural flavours of homemade fish sauce and fresh seafood from the sea. “We often go fishing in the evening and return with a fresh batch of fish to the market early next morning. The remaining fish can be dried for selling every weekend,” Liêm said. “I used to earn VNĐ70 million ($3,000) each year from fishing. A bumper fishing trip could bring me a tonne of fish each night. Now, the fish is selling out faster, with retailers and vendors collecting them as soon as my boat reaches the shore at dawn,” Liêm said. Now, the village hosts 500 visitors each day, and 2,000 on holidays. 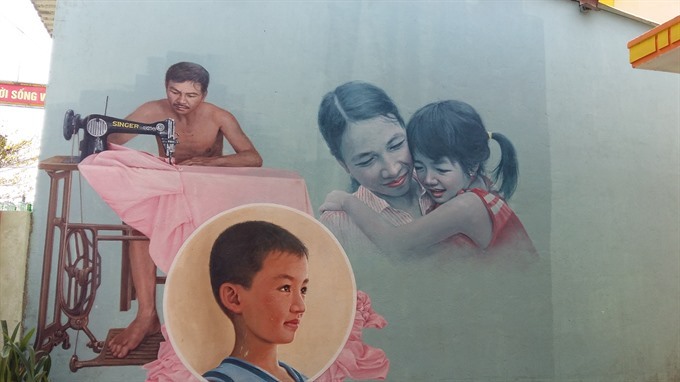 The director of the Korea Foundation in Việt Nam, Park Kyoung-chul, said introducing wall paintings to Việt Nam was part of efforts to contribute to life with art and culture in the international community. He said the foundation had joined forces with UN-Habitat Việt Nam, which is helping the country’s cities develop sustainable urban environments. “It was a chance for experts on community art and urban development from the country and South Korea to get together to share ideas, experiences, and expertise to find ways of implementing community art in Việt Nam,” he said. Artist Oh Ye-seul, 25, who has participated in many village mural projects in South Korea, said she painted a wall with a picture of Olaf, the beloved character from the animation film Frozen, because she thought that the image and sparkling snow would delight local children. “We wanted to bring new vitality and a jubilant atmosphere to the village,” she said. The Korean supported cultural programme has converted the area into an ecotourism site. 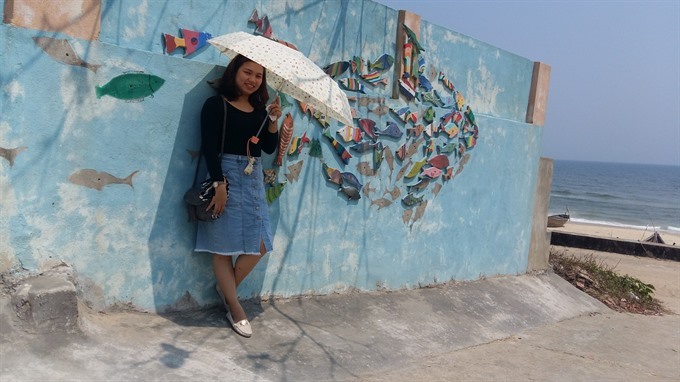 “The mural commune of Tam Thanh sparked the idea to build an art space in the community as a base for tourism development. 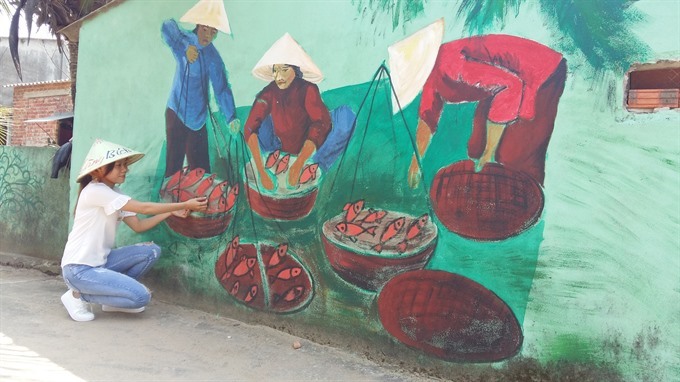 The art space – offering painting workshops and decorating houses and fences – will attract tourists looking to explore the village’s culture and lifestyle,” said Nguyễn Minh Nam, vice chairman of Tam Kỳ City’s People’s Committee. This thought led the city and Tam Thanh Commune to launch a community-based art space as part of a tourism development pilot project. Nam said the project is Việt Nam’s first to weave art space into a community’s daily life. However this has posed new challenges in terms of hospitality education, including culinary skills, accommodation management, guide services and environmental protection. “We have launched a series of programmes to raise awareness of community-based tourism among the local people. Environment protection, infrastructure investment, security, home-stay service should meet the standards of a genuine ecotourism site,” Nam said. He said a rubbish-free village campaign was launched last month, calling on villagers to keep their houses and environment clean. “We plan to decorate public roads with green trees and flowers. All walls and fences of houses will have creepers or other environmentally-friendly decorations. “More bus routes are planned for people to get here from tourism hub of Hội An, Tam Kỳ and Đà Nẵng,” Nam said, adding that rest stops and trashcans will be located at many places in the commune. The homestay service is planned to be limited to 20 households so that village facilities are not overwhelmed, he said. Last month, artists from the Singapore Technology and Design University, Việt Nam’s Fine Arts Association, colleges in Hà Nội and local painters were collaborating on coracle painting for an exhibition in the village. Chairman of the ecotourism site and community art space project, Lê Diệu Ánh, said the art space was the first-ever project developed from ideas and consensus of local people. “We try to bring artists who can create art on fishing tools, walls, and public works and fishing boats. Community art space is lacking in most Vietnamese rural villages,” Ánh said. “Villagers were asked to decorate their houses and fishing tools with paintings, and even the community-based tourism service was approved by the public,” she said. Ánh said the project only offered ideas and plans for developing an ecotourism site in the village, but villagers were the real decision makers. Artist Nguyễn Thượng Hỷ said the art space was freely designed with contributions from the community. “It’s the first time that we’ve painted in an outdoor space and on bamboo coracles and boats rather than on canvas in a gallery,” Hỷ said. “Villagers provided boats, fishing tools and coracles, while artist donated their paintings in a joint artwork. “This created a first-ever collection of painted coracles in Việt Nam, and we want to turn the fishing village into an art space serving tourists,” he said, adding that around 100 coracles will be painted in a prolonged project. Artist Vũ Đức Hiếu said painters took inspiration from daily life in the fishing village, using watercolours to depict locals on fishing trips, weaving nets and making bamboo baskets. Ánh said better income in a clean environment and well-protected habitat could persuade local villagers to lead the way to a sustainable, successful development project. She hoped that the community-based art space combined with tourism would be an example for other rural areas in finding their own ways to boost tourism and traditional culture.